Virtual Races with Medals for Charity! Cost: $25 – FREE Shipping! About this Virtual Run: The Rainbow Run 5k kicks off a week of Pride in Melbourne, Florida in September. If you can’t make it to the race, you can still support the cause and earn an official “Run with Pride” finisher medal by participating virtually and running or walking whenever and wherever you want. 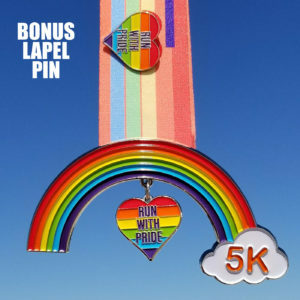 All participants will also receive a bonus heart-shaped “Run with Pride” lapel pin. 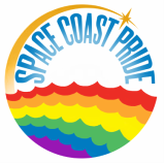 About the Charity: Space Coast Pride, Inc. is the Lesbian, Gay, Bi-Sexual and Transgender community organization for Brevard County, Florida and a non-profit 501(c)3 charitable organization. Its primary focus is to foster a sense of community among LGBT residents and to bridge the divide with our straight families, friends, neighbors and organizations. Virtual Strides Partner Event: This event is part of the Virtual Strides Partners Program. Up & Running Fitness and their charity partner, Space Coast Pride, will receive 100% of the net proceeds from this event after Virtual Strides’ partner costs are deducted.